Home Featured Business The Freeman Center’s History with Ripley’s Believe It or Not! 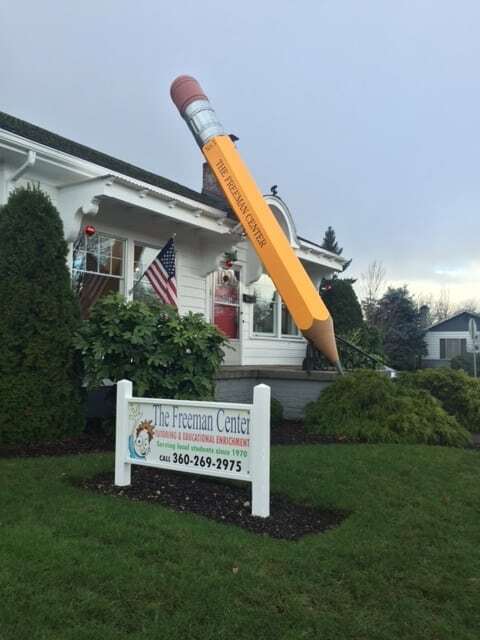 When you see the giant yellow pencil leaning up against the outside of the house, you just know you’re going to find fun things inside The Freeman Center. 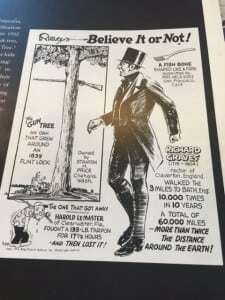 But what does Ripley’s Believe it or Not! have to do with it? In 1970, Steve Freeman, owner of The Freeman Center, was an elementary music teacher, teaching at seven elementary schools. Then he was assigned to teach a remedial math and reading program. “I didn’t want to do it at first, but it turned out to be the best thing that ever happened to me,” Freeman smiles. One day when he was teaching at Washington Elementary, he had six sixth-grade boys who were not happy to be there. He kept trying to think of ways to get them engaged. 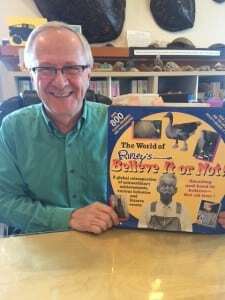 Then one weekend at a garage sale, he found a Ripley’s Believe It or Not! book and took it to class. The kids saw a story in the book that was about a flintlock rifle stuck in an oak tree. The most exciting part about it? The story stated that it was owned by a local man in Chehalis. The boys got very excited as Freeman started teaching them how to research if the story was in fact true. This story, about the rifle in the tree, started Steve Freeman on the track of using oddball stories and items to help students learn. The boys started researching their questions. Did oak trees grow in the area? Did flintlock rifles indeed exist during the time period of the story? The students looked in the phone book for Stanton Price, the man, who supposedly owned the tree, and found a name in the town of Oakville. Disappointment set in when they called him and he said he didn’t own anything like that. But just before they hung up, he told them there was another man with the same name in Chehalis, and how they were always getting mixed up and getting each other’s mail. In 1997 the local newspaper, The Chronicle, featured an article on the Freeman’s class. 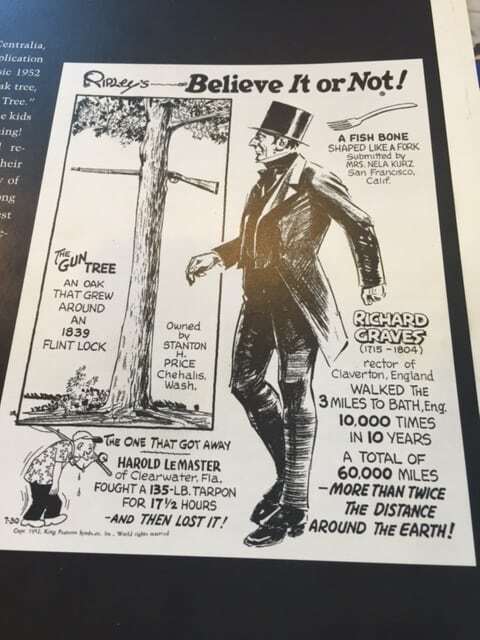 This prompted a gentleman from Littlerock to share his first-hand knowledge of the gun trees. Once Freeman realized how the Ripley’s book excited his students, he helped them write letters to leaders all over the world to learn about items they chose from Ripley’s. They often received informational letters and souvenirs in return. Use of Ripley’s materials continued as internet access was introduced to Freeman’s classes. He contacted Ripley’s to ask for permission to post their cartoons as he helped students build a website showing their work. “Soon, Robert Whiteman, licensing director for Ripley’s called. He was very supportive, providing a box of books and posters for the kids, as well as the permission we needed,” Freeman says. 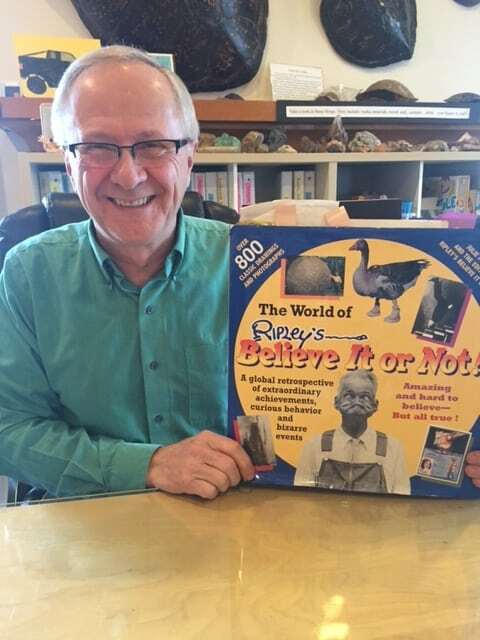 Steve Freeman holds a copy of Ripley’s Believe It or Not! In 1998, Freeman was invited to New York to meet with Mr. Whiteman about developing educational uses for their products. In 1999, Freeman organized “The Odditorium in the Auditorium” at Washington Elementary. Edward Meyer, VP of Ripley’s, along with the owner of the Ripley’s Believe it or Not! store in Newport, Oregon, and Julie Mooney, author of a pending Ripley’s book, attended the event. And best of all, Freeman’s story of using Ripley’s stories to teach his students ended up as an entry in Mooney’s book of Ripley’s Believe it Or Not! Fast forward now to 2001. Freeman retired from public school teaching, and decided to continue helping kids learn through odd items by opening up the Freeman Center in his home. In 2007 he purchased the building that now houses the facility. Each room is like a weird museum. Shelves contain interesting items like a Civil War era cannonball from Onalaska, a WWI practice bomb, petrified wood, skulls, dinosaur bones, fossils, and a Chinese foot binding shoe. You can see why kids would love it, even as an adult it’s easy to get mesmerized by the unusual collection of oddities. Oh, and that giant pencil out front? Freeman got the idea when using a pencil’s hexagon shape to teach geometry. Later he decided to make a giant one. Freeman explains, “I enjoy a challenging project.” Once completed, he entered it in a contest called, “Build it Extreme” on Instructables.com and won first place. One can imagine his own passion for odd items influences his students as they learn from real-life relics. The giant pencil in front of The Freeman Center tells you that you are at the right place. The Freeman Center serves students from four to 77. Whether lagging behind or bright and bored by not being challenged in school, students are fascinated by the odd and interesting items filling the center. They typically have no problem finding an artifact that really speaks to their interests and then Freeman and his staff use that interest as part of a plan to improve individual student’s skills. The Freeman Center is located at 1020 W. 1st Street in Centralia. You can reach the center by phone at 360-269-2975.